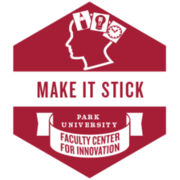 The Make it Stick special interest group provides a collaborative learning environment to explore the integration of emergent technologies in instruction and learning, while building skills and self-efficacy to bravely embrace the unknown. This badge acknowledges participation in a faculty learning community focused on learning about and applying new technologies to support learning. Recipient has learned about and implemented practices for Make it Stick to the extent that she/he can influence the learning of others inside or outside the Park University community. He/she has shared their expertise on the topic of Make it Stick in one or more Park-sponsored or FCI-sponsored events (such as presenting an FCI Innovation Exchange, creating an FCI “Two-Minute Mentor,” presenting at a Department, School, or College meeting, facilitating a session at the Annual Assessment Institute or a similar University-wide event).